Traditionalists in the Anglican Church have been angered after two gay clergymen exchanged vows in a version of a marriage ceremony. The service, at St Bartholomew the Great Church in the City of London last month, used formal rites. The Reverend Peter Cowell and the Reverend Dr David Lord were already civil partners. Critics say the ceremony flouted guidelines, but the vicar who conducted it said church rules were not broken. The couple are said to have exchanged vows and rings in front of hundreds of guests in the event thought to be the first of its kind in the Anglican Church. 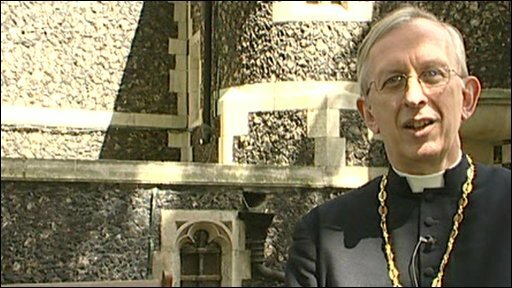 The service was conducted by the Reverend Martin Dudley, who told the BBC he had not broken any instructions issued by the bishops. "It wasn't a gay church wedding, it was the blessing of two people who have contracted a civil partnership. "They wanted more than I was able to give - they wanted something more like a wedding. I was not willing to do that because I believe that marriage is the union of a man and a woman. "Therefore we had to negotiate the form of the service, the words that were used, so that I could say them with integrity, but they also found that they expressed their love for each other and their commitment to each other. "But what we actually did was to celebrate in the context of holy communion, of a solemn celebration of the eucharist, their love for each other." But the Reverend David Banting said Mr Dudley and the couple were in rebellion against the teachings of the Church, and the guidelines and authority of the bishops and archbishops. "There is bound to be consequences. It is very difficult to exercise discipline in the Church of England because things have gone such a long way down this sort of track. "But yes, I would expect there to be consequences." The Archbishop of Uganda, the Most Reverend Henry Orombi, told the Sunday Telegraph: "The leadership tried to deny that this would happen, but now the truth is out. "Our respect for the Church of England will erode unless we see a return to traditional teaching."